Alex Lent contacted me and asked would it be possible to bring to the attention of Library Directors everywhere a group called The Library Directors Group. With that in mind could you please RT this post, share with those you think it might interest. And even copy and paste and share on any LIS mailing lists you think might be interested. The resource looks invaluable, and, I would argue, not just of use to current library directors, but those who would like to be in that position down the line. Last year, I started the Library Directors Group, which exists to facilitate communication, collaboration, and continuing education for library directors, especially for those library directors who are in their first five years on the job. This group is the resource I wish I had had on my first day as a library director and it has been a huge help over the past year. I'm writing to tell you about the group because I think it could be useful to you as well. 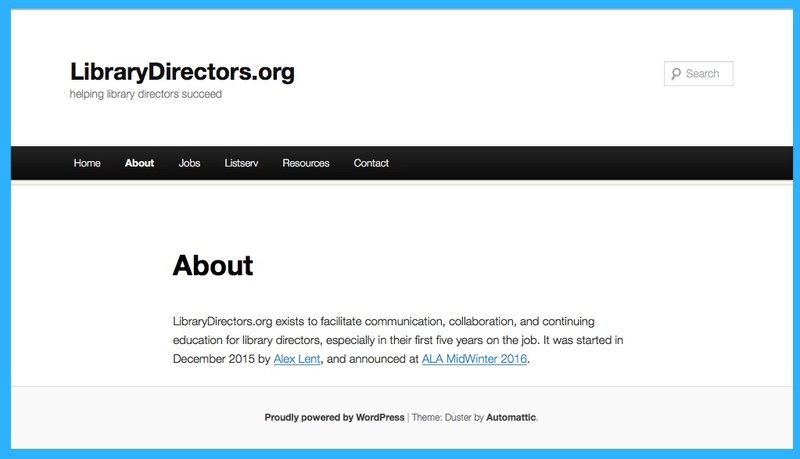 We have a website, which has a list of resources other library directors have found useful, a blog which will soon be posting a steady stream of original content from a number of authors, and a link to a list of library director job postings. 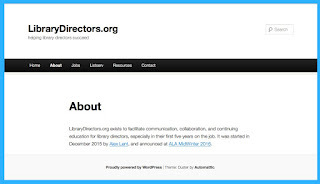 We're also on Facebook (facebook.com/librarydirectors) and Twitter (twitter.com/libdirectors). One of the projects we're working on right now is gathering as many state-produced manuals for library directors as we can. We've reached out to COSLA to help with this and the manuals have started to trickle in. Ultimately, we hope to have as complete a list as possible of these sorts of manuals. We are also working to have a presence at as many library conferences as possible, hosting round tables for directors (and anyone who is interested in library administration) to discuss the challenges they face, share their experiences, and build a network of other directors who they can rely on for advice. I've been leading most of these round tables, and I'm hoping to convince other people around the world to lead round tables in the same format at their local conferences (although, if you want to fly me to Ireland to lead round tables or workshops, or give conference presentations, I would LOVE that). But our most active platform is our listserv, which you can sign up for at librarydirectors.org. We have over 300 members from all over the United States and Canada and are looking to expand overseas. We've had questions on Friends groups, contracts, fundraising, mentoring, and a wide variety of other topics. Librarians are a question-friendly bunch and this listserv has proven quite useful. If any of this sounds interesting to you, please sign up at librarydirectors.org. If you have any questions, you can email me at at alex@alexlent.org. At the recent SLIP Conference one bit of advice given to early career librarians was to write, to publish. Libfocus was mentioned as a good place to start. In the spirit of that sentiment we present three reviews of the event, all presenting a personal perspective of a different author. James Gracey is a Library Assistant at St Mary's, Belfast. He studies LIM at UU. The recent SLIP conference in Dublin was dedicated to the provision of advice and information for recent graduates, and for those new (and indeed not so new) to the profession who might wish to advance their career. Proceedings kicked off with a discussion between representatives from several institutions offering LIM courses. Professor Kalpana Shankar (UCD), Marie O’Neill (Dublin Business School) and Dr. Jessica Bates (UU) reflected on various changes in the sector and how these have influenced certain changes and modifications to the LIS courses they each offer. After this discussion, various ‘lightning presentations’ were delivered by current students and recent graduates, all of whom shared personal experiences, offered practical advice and presented with efficiency and passion. The current, frankly Orwellian climate of fake news, political propaganda, misinformation and ‘alternative facts’ was addressed by Professor Kalpana Shankar in her quick-fire talk Why Information Professionals are Needed More than Ever. Kalpana detailed, with some urgency, the vital work carried out by ‘renegade’ information professionals, such as data rescue, the promotion of information literacy and guerrilla archiving, in an ongoing attempt to keep federal climate and environmental data accessible and untainted by those who wish to alter it or wipe it from existence. Recent graduate and Trinity College librarian Jesse Waters discussed his endeavours to find a permanent position in My First Year Out of Library School. Offering practical advice and sharing anecdotes of working 40 hour weeks in various positions to further his experience, Jesse talked about the importance of determination, commitment to professional development and a positive mental attitude in navigating the uncertainty and knock-backs of post-graduate life. Current PhD students Anne Marie McInerney and Jayne Finlay discussed their current research into prison libraries and the importance of literacy in rehabilitation. Jayne also reflected on the importance of embracing change and the unexpected, the wide range of roles within the LIS profession and how they can interconnect and complement each other, ensuring the honing of transferable skills. Other speakers explored the importance of presentation and stepping outside of comfort zones, the librarian’s role in promoting literacies, the importance of critical thinking while networking (which can often just perpetuate positive reinforcement), balancing the need for qualifications with acquiring experience, the interdependence of theory and practice, the utilisation of transferable skills, and the importance of continuous professional development, which was reiterated throughout the day. The closing discussion was a personal highlight because of the practical advice offered by the panel - Jane Burns (RCSI), Meadhbh Murphy (UCD Archives), Katherine McSharry (National Library of Ireland) and Helena Byrne (British Library) - and because of their candidness and camaraderie. Amongst a deceptively wide range of subjects they discussed increasing digitisation, how to further experience, wielding a positive attitude, dealing with confrontation, improving your CV, networking, mentoring, and preparing for interviews. The rapid delivery of the presentations throughout the day ensured a lively pace and the opportunity to informally approach speakers ensured an engaging atmosphere. Ultimately, Connecting the Dots: From Study to Practice provided a very positive and encouraging experience for attendees. Stephanie Chen is a recent MSc Information and Library Management graduate, volunteer at the Royal Society of Antiquaries of Ireland and blog manager for SAH Journal Blog. The 2nd Annual SLIP Conference took place on Saturday, February 25th at Pearse Street Library. The theme of the conference this year was “Connecting the Dots: From Study to Practice” and featured two expert panels as well as lightning presentations and posters from current students and recent graduates. As a recent graduate from the MSc Informatiom & Library Management program at DBS, I’ve highlighted a selection of points that resonated with me below. The conference opened with a Library School Panel Discussion with Professor Kalpana Shankar from UCD, Marie O’Neill from DBS, and Dr. Jessica Bates from Ulster University. Key remarks included Dr. Jessica Bates and Professor Kalpana Shankar stressing the importance of theory and having a strong foundation to inform practice and Marie O’Neill offering practical advice of publishing, joining associations (such as the LAI), and, of course, networking. But, what I found most important, was the commitment they all had towards supporting and advocating for students and graduates. I got the sense the panel was keenly aware those in library school are the next generation of leaders. As such, the three library schools recognize they have a responsibility to equip students with the necessary knowledge and skill sets to succeed. It was reassuring to know all three library schools were involved in the formation of the Information Professionals’ Network, which will be hosting its first Careers Expo on May 19th. Not only will this Expo highlight the numerous skill sets we as students and graduates have, but it will also create opportunities for more non-traditional librarian roles. In his lightning presentation, recent graduate Jesse Waters offered attendees great advice: be flexible and be involved. I was impressed with his ability to recognize gaps in his skill set and commit to constantly upskilling. Case in point – he wrote a blog post and made a poster because they were things he’d never done before. His willingness to step outside his comfort zones to close these gaps is something I feel we all should strive to emulate. Speaking on behalf of the Library Association of Ireland (who sponsored the event), Dr. Philip Cohen highlighted the various ways in which the LAI supports the library and information profession – through accreditation, awards, formal and informal networking events, and much, much more. Most relevant to the attendees was the fact that student membership in the LAI is free for 2 years. Professor Shankar, speaking on behalf of the event’s other sponsor, UCD School of Information and Communication Studies, also gave a short talk on the value of and need for information professionals. The passion Professor Shankar showed in her talk was inspiring and highlighted the fact that the profession is relevant now more than ever. We are the ones who come equipped with skills to “rescue” data, combat “alternative facts,” and manage the high volume, velocity, and veracity of information. In her lightning presentation, Jayne Finlay, a first-year PhD student at Ulster University, traced her career path and demonstrated how it has not always been straightforward, a fact I feel many of us can relate to. Through her experiences as a student and assistant librarian, she realized her strengths and interests were in doing research. By drawing from her own personal experiences, Jayne demonstrated the importance of critical self-reflection as it can reveal how one can best contribute to the profession. Lastly, Jayne closed her presentation by asking attendees to be open to new paths and, most importantly, to say yes to things that scare you (like writing a blog post!). The conference closed with a Practitioners Panel Discussion with Jane Burns, Meadhbh Murphy, Katherine McSharry, and Helena Byrne, who all offered fantastic advice. They stressed the importance of highlighting all transferable skills, doing all you can to demonstrate your competency, and being resilient. One key theme throughout the day was the importance of getting involved and engaging with the profession. While library school can equip us students and recent graduates with a tremendous array of skills and a strong foundation, at the end of the day, the onus is on us to use these skills and upskill. We are the next generation of leaders so we should be making our voices heard by joining groups, publishing, and presenting. On Saturday the 25th of February 2017 SLIP Ireland held their Second Annual Student Conference. SLIP or Students, Librarians & Information Professionals Ireland is a relatively new organization to the world of library and information and champions the need for more discussion in the field of Library science in both practical and theoretical terms for students, librarians and other information professionals. The Theme of this years conference was “Connecting The Dots: From Study to Practice”. 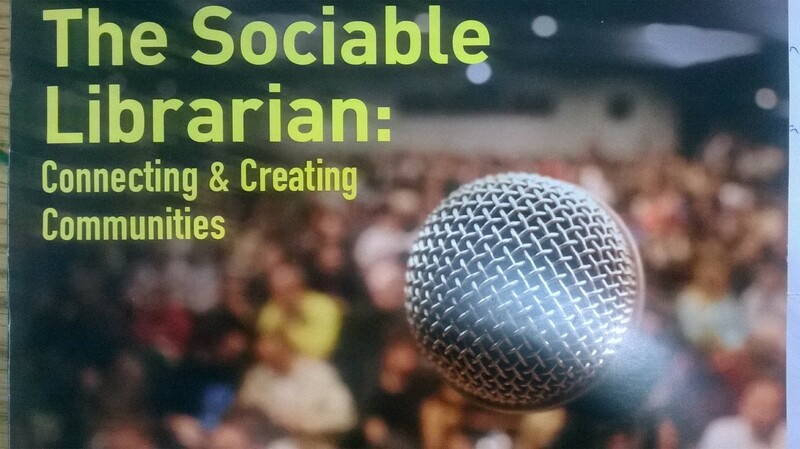 As a newly qualified Librarian myself, I felt attending this conference was a huge benefit to me personally and gave me more awareness about the steps I need to take as a budding librarian to help my career flourish. Not only were the presentations and panels highly interesting and teaming with information but I found them to also be quite reassuring. I don’t know about you, but oftentimes when I speak to fellow graduates about the struggle to establish oneself as a librarian or information professional and to pin down that sometimes elusive dream librarian position. I find I am not alone in being disheartened occasionally. This conference helped me to meet other graduates in the same boat as myself professionally and helped to thoroughly re-energize my motivation and my ambition to succeed, while providing me with useful and career changing advice. Next Anne Marie McInerney opened our eyes to an outlet of Library and information needs I was not very aware of in her talk on Prison Libraries and Prisoners’ Information Needs. A short break was taken and afterwards we were treated with some more presentations by Jayne Finlay, Gary LaCumbre, Michael Arnold and Rachel Hludzinski. Jayne spoke to us about how her library experiences shaped her research and advised us to “say yes to things that scare you and don’t be discourages. Network, do CPD and follow your interests and they will lead you where you need to be.” Gary spoke to us about Networking as Critical Disengagement: Crisis in the Information Profession and how to be mindful of when and where we network. Michael spoke to us about the importance of presenting and reminded us “ sometimes what you don’t see as your main strength may actually be very unique to you.” Rachel taught us all a little about digital literacies. I felt I learned some valuable new things from her presentation. Posters were also presented at the conference. This year featured a poster by Sarah Connaghan on Three Phases of Understanding: The Job of a Librarian. Éanna O’ Keefe, Enda Kehoe, and Stephanie Chen also presented a poster From Cupboard to Cloud: How a Small Organization Carries Out a Large Scale Digitization Project. Both of which have inspired to try my hand at a poster of my own this year. And finally the day ended with a hugely beneficial closing panel of: Jane Burns (RCs), Meabh Murphy (UCD Archives), Katherine Mc Sharry (NLI) and Helena Byrne (The British Library). I found this panel to be extremely helpful; they gave guidance on how to further your career, how to future-proof yourself and how to be resilient and to value yourself even in the face of rejection. I felt the conference was a huge success and I personally cannot wait for next year! I hope it inspires you as much as it inspired me. Guest post by Emma Barthes, student Masters of Library and Information Studies,UCD. Previously: Bachelor of Arts in English language and literature and classical archaeology in the University of Geneva. I was fortunate enough to attend both days of the Academic and Special Libraries (A&SL) 2017 conference as a student conference assistant. Not only was I able to see behind the scenes, I also got the opportunity to attend most of the talks. From the warmth and excitement of the people attending, it is fair to say that the A&SL conference is a much anticipated event in the library community. This short article will focus on the second day of the conference, Friday 17th of February 2017. The conference took place in the Radisson Blue hotel in Dublin. As I entered the main conference hall, I was struck by the spacious room, and how professional it all looked. Cameras and audio were also being prepared while power points were being tested. 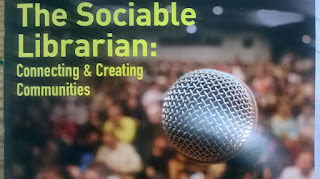 The atmosphere was full of anticipation as the second day of this year’s conference – focusing on the Sociable Librarian: connecting and creating communities – was about to start. 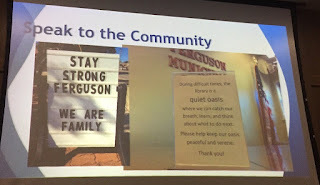 The excited atmosphere soon changed to being very attentive and emotional for our keynote speaker of the day: Scott Bonner , Director of the Ferguson Municipal Public Library. He travelled from the United States to share his experience about his response to Ferguson’s dramatic events last August. Scott depicted how he and his staff reacted during the time of the incident in August as well as the weeks following the announcement of the Grand Jury in November. His presentation touched upon points involving safety and the decisions that needed to be taken in such a short time and the issues that could arise. I have to say that, at the end of Scott’s very personal and honest segment, everybody in the conference room seemed really moved. Having talked to some of the people who attended Scott’s talk, many told me that they admired Scott for what he did and even teared up at the end of his presentation. Following Scott’s Bonner’s poignant presentation, the conference continued with two lightening talks. The first one was given by Frank Brady – faculty librarian for science and engineering and also faculty librarian for theology - and Pauline Murray – faculty librarian for arts, Celtic studies and philosophy - both from the University of Maynooth. The talks focused on how to improve libraries for users and students in particular. Solutions like a pop-up library were addressed in order to raise the profile of subject librarians and their resources. The second lightening talk was given by Simon Perry – systems librarian for computing and science at the institute of Carlow – and Sue Ramsbottom – member of the Irish Defence Forces and Defence Forces librarian in Co Kildare. They introduced us to their project on online tutorials to enhance the information literacy needs of students of the Defence Forces through IT Carlow. After this very interesting presentation, people had to choose between three different parallel sessions. I listened to Lorna Dodd – senior librarian at Maynooth University - who talked about the important role of a librarian in the development of a critical skills community of practice at Maynooth University. Issues such as understanding ethical responsibility in regards to plagiarism are essential for students and one of the many skills that a new “community of practice” would be able to develop and support. After a delicious lunch - which surely put everybody in a receptive mood – the second and last part of the parallel sessions took place. I attended Mark Ward’s - from South Dublin Libraries – presentation on Coderdojo and the pros of implementing this club in your library. It was really informative as he went on to describe his own experience of starting this program and highlighting the issues to avoid. The main takeaway of Mark’s talk is that libraries are the ideal setting for running a program such as Coderdojo. People then gathered again in the main conference room for two lightning talks. The first one focused on how using an online tool can inform students about the location of the library. It was presented by Sarah-Anne Kennedy – subject librarian for media and law at the Dublin Institute of Technology. Sarah told us about the benefits for both students and staff that the “library learning” project has had. It consists of sending 10 mailouts to the students during the academic year which helps the library to have a bigger reach to students. The second lightening talk was given by Laura Rooney-Ferris – information and library manager of the Irish Hospice Foundation - and Michael Ferris – library assistant at the Bar Council of Ireland law libraries - on their personal experience of creating podcasts. The aim of their “Librarians aloud” podcasts lies in expanding the reach of information professionals with interviews that are released on Soundcloud which provides a worldwide outreach and helps amplify librarian voices. 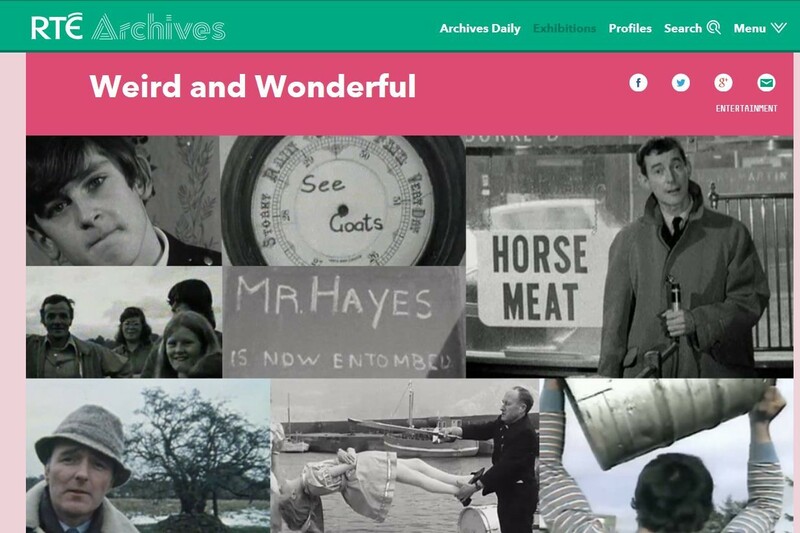 The last talk was given by Liam Wylie – curator at RTE Archives – presenting his ways of engaging with a wide audience through social media. Twitter has to be one of the greatest ways that Liam managed to do so by creating daily posts (#WeirdandWonderful) in which he published three new stories about Ireland and its people found and retrieved from the RTE archives, demonstrating that social media can be a great way to reach people. Since most of the conference was recorded, I can only recommend that you go to the recordings on the Academic and Special Libraries website if you did not get the chance to attend this year’s conference or did and just want to listen to it again! Lastly, I would like to mention the A&SL committee, they not only did an amazing job at organising these two very informative and very pleasant days but keep libraries - and their great variety of professions – very much alive! From my own perspective as a student, I must say that the A&SL conference was really eye opening on how various the professions in libraries are. Assisting the A&SL conference for the first time, I must say that it was a fantastic experience and opportunity. From the setting and the food – delicious – to the quality of the speakers, A&SL is an outstanding event and is already worth putting in next year’s diary! Following on from our post on Irish library events for Autumn & Winter 2016, here are details of a lot of great library events to look forward to in 2017. I'll make ongoing updates to this post so please let me know about any new events, changes needed or extra details as they are announced. A series of events across February and March celebrating the first fifty years of the Berkeley library building. Dublin Business School, Aungier St.
Inaugural John Dean Debate: 'This house believes that invisible librarians have contributed to the post-truth era. Debaters: Ms Aoife Lawton (proposing) and Dr Philip Cohen (opposing). Wednesday March 15, 6.00 - 8:30pm. "Collections vs. Libraries. What matters?" "Fake news is an oxymoron, and a LibGuide won’t cut it"
A talk by Alan Carbery, Associate Director, Champlain College, Vermont, USA. Our library exchange to University College Cork (UCC) library during October 2016 has been a very rewarding experience. Both Melissa and I work at the University of Malta (UoM) Library branch, catering for pre-university students (16-18 years old). We have always wanted to learn and discover how other foreign academic libraries differ from our own academic library. This was our first experience abroad job shadowing another academic library. Upon our arrival we were given a very warm welcome from all the UCC staff and throughout the two weeks that we stayed there we had the opportunity to see and work with almost all of the UCC library departments and its branches. During our first day at the library we were given a detailed tour by one of the liaison librarians. A lot of the services offered at the UCC library, also known as Boole Library, are very much similar to our own main library at UoM. Several services include the circulation desk, short loans section, photocopying service, exhibitions, study areas, special collection, archives, acquisitions, cataloging department etc. Since UCC caters for approximately 20,000 students, the main Library building is much bigger than that of UoM. In fact, it spreads over 5 floors. They have the space not only for meeting rooms offered to students which can be self-booked but also other rooms which provide business advice to students and staff of UCC. Unlike the UoM Library, all books at UCC have the RFID system, which permits the users to check out and return books through the self-issue machines. This is something which our management is planning to do in the future. Also, each student has a UCC pass which allows him/her to make use of the library by entering through a security threshold, unlike the UoM Library, which is open to all patrons, from University students, staff and external visitors. The UCC Library operation plan is to optimize more library spaces. In fact it wants to start the laptop loan station (chrome book), where laptops can be rented for four hours and this can be done by self-issue and return. The library is also aware that their website is important to attract more visitors. Therefore, they have issued a library web redesign project to make sure that the library is being kept up to date with the current situations of the UCC. Overall, The UCC library’s mission is to deliver high-valued, responsible services that promote best practices relating to Open Access, Research Data Management, and Digital Collection Management. At the circulation desk, we were welcomed by Ann Byrne. We must say that she answered all of our questions very professionally and showed us how to use the library IT system, called Sierra. We had the opportunity as well to attend to some of the students’ queries. On our 3rd day we were introduced to Ronan Madden who heads the acquisitions department. The staff here takes care of all the monographs, serials and journals of the library. Most of the yearly budget goes for the subscriptions, and the rest of the budget goes for books. The staff told us that UCC library is also a legal deposit library but not obligatory. In fact part of their work is to run after material that has been published recently to acquire a copy of it. They currently possess over 889 e-Journals. The Irish Research eLibrary (IREL) also helps the UCC library with the payment for databases. In the afternoon we went to the Mercy University Hospital Library (MUCH) which is an evidence based clinical practice. This branch library keeps people up to date with newly developed research. This branch is not visited by many people as less and less are making use of textbooks; however there is a high demand for online subscriptions of journals and articles. On our 4th day we went to another medical branch library called Cork University Hospital (CUH) which basically offers the same services as Mercy University Hospital Librar, but at a larger scale. Later that afternoon we visited the Electronic Resource department. Here on a monthly basis, they input the list of newly acquired books on the website. Our 5th day consisted of learning about the library’s Collection Development and Management. This department is rather new and has been open since January 2016. Ger Prendergast, the CD&M librarian, main work is to look at loan period usage of books in the last 5 to 10 years. This is done by using the IT system Sierra. For example, some books which have not been used for years are taken off the shelves and put in the library’s store. Duplicates are mostly thrown away and with regards to the damaged items, it depends on whether they have been used recently or not. The library has also taken off physical journals off the shelves for those which are accessible online. On our 2nd week in Cork, we were taken to the Institutional Repository Department. UCC has no technical support in IR and so they use a support company Atmire, a Belgian Company, for any difficulties that they might encounter. Unlike what we do at the UoM Library, this department does not do any digitization of material to be uploaded on the IR, but search for articles and dissertations that are already available online and can be put in Open Access. Their mission is to try to persuade the UCC academics to deposit their academic work as much as possible. Currently, they are requesting policy mandates for publications. They have to introduce a policy in order for researchers and academics to input their works in the IR. We have noticed that the subject headings inputted on CORA are written and decided by the student (in the case of e-dissertation). There are no regulations with subject headings, but all keywords inserted have to have the first word capitalized. At our UoM library, we stress a lot on the uniformity of subject headings and we follow the Library of Congress Subject Headings list, when cataloging material on the cataolgue and on the IR. The department has a weekly meeting called “Harvesting articles pilot project” or HAPP. The project’s aim is to know how they are getting on with the IR. The staff here makes their utmost to search for UCC materials online. They email UCC authors to see if they want their work to be put on the repository if the work is not found in Open Access. If on the other hand, the articles are already in Open Access, they inform the author that their work has been put on the IR. The staff is hoping to find an increase in CORA and also that within a year 50% of the material would become Open Access. On our 8th day we visited Boston Scientific Health Sciences Library where we were warmly welcomed by all the staff there. BSHS library is another Medical branch library of UCC Library. Our experience there was very similar to the other branch libraries of UCC. However, they also check every new book that they receive from the Boole Library whether the books have been inputted in the Sierra. Then, they note the date the book arrived at the floor. There is a subject librarian, who creates reports on the usage of books. As with the other libraries, Brookfield library also weeds material that hasn't been used for many years. They also provide information literacy session to students. On our 9th day at the UCC library, we went to the Special Collections department. Elaine Harrington told us that they organize exhibitions and most of their exhibitions are booked up to 2 years in advance. There is also the archive section, a storage section, an archive reading room for students and a restoration room of old Journals. Students can make use of 1 room for newer material and another room for the older material. Here the student makes the request by filling a form and then the librarians search for the material themselves. At our UoM Library we have a special section that works in this manner. It is called the Melitensia section. The books found in this section have to have something that refer to Malta. It can either be written in Maltese or in any other language, about the Maltese Islands, or written by Maltese authors. General reference books, folios, etc., are found in the Special Collection department. They mostly have printed materials, but also other items such as CD’s. They have a room specifically for microform. Students can come in and make use of this room. There are 4 reader printers and 2 scan pros. They are like PC’s but students can scan microform reel images and make a copy on their pen-drive for free. In the archive section you will find all sorts of old materials. They are put in a low temperature room in order to preserve the materials. Most materials are stored as seen in the images above. Materials stored at the archive section range from 18th century dresses and men suits, to old maps, personal diaries, manuscripts, newspapers, census, state papers, parliamentary papers, etc. The date range of collections starts from the 15th century to the present day. There are approximately 52,000 items in the Special Collections. We were very lucky to see some of these special items that are carefully stored in the library for exhibition purposes as well as for research. Through this experience we have learned that the UoM library is taking the same direction as the Boole Library, in terms of going from a physical library to more digital. Both libraries face the same problems, which are both trying to deal with. At the moment, both libraries are trying to encourage their respective University academics to publish their material on the IR. This is in fact the next step to going digital. Furthermore, there were some tips that were given to us which were beneficial, like the Information Literacy sessions, which we attended as well, as we both deliver the same sessions at our library branch in Malta. This mobility programme has been a very successful experience to the both of us. As our stay was for two weeks, we were able to visit a lot of departments and branch libraries situated in Cork. We even had the chance to visit the stores, situated outside the campus, which was going through a ‘spring cleaning’ phase. Through these two weeks we got to know almost all of the staff at Boole Library and we were amazed by their very warm welcome, and we wish to tell them thanks for their help and hospitality. We will surely recommend Cork University library to anyone who wishes to visit or job shadow a foreign library, where the staff is very helpful, and since everyone speaks English it is a plus. We also recommend touring the area and beyond, which is amazing!